If you’re a parent chances are at some point you’ll be leaving your child under someone else’s care this summer. Of course, anytime that’s the case there is a lot of trepidation. As a parent, you know it only takes a split second for someone to get hurt or upset and then chaos can quickly ensue. Any babysitter you hire will need to be able to handle those uncertainties while also keeping everyone as safe as possible. To help ensure your babysitter keeps everyone out of harm’s way this summer, you can gently guide them in the right direction by first supplying them with this swimming safety guide for babysitters. Then, give them some activity ideas to keep your kids occupied and happy. Here are a few safe options that your kids will enjoy. Clean up a natural area. In its list of fun ideas for parents and babysitters, Care.com suggests visiting a local natural body of water to clean up its shores. Of course, you should provide gloves and any other needed protection. Then, once the cleanup is done your babysitter can have a picnic with the kids. It’s a great opportunity to teach the them about respecting God’s earth and also about how to be safe around natural bodies of water. Play “The Waiting Game.” ChristianityCove.com offers a great game for babysitters to play with their charges. “The Waiting Game” teaches patience and faith. All you need is a ball. Have the children stand in a circle. Toss the ball in the air and call a child’s name. They’ll have to try to catch it before it hits the ground. Then the game turns into tag with the child with the ball trying to tag another child. 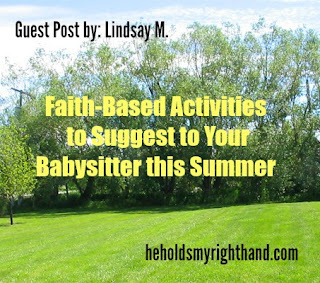 Jump in the pool for faith-based “Categories.” If your babysitter is taking the kids for a swim, give the pool game “Categories” a Christian twist. 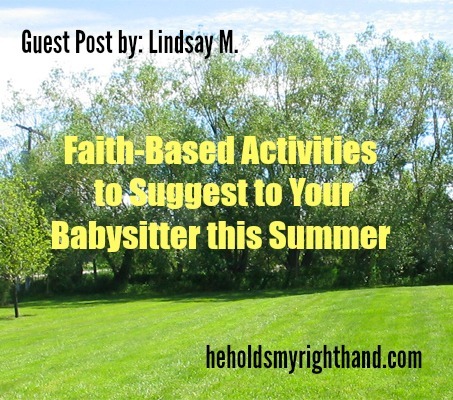 Your babysitter can provide the category—e.g., books of the Bible, names of disciples, etc. Choose a child to be the guesser each round. While the kids will find this to be a lot of fun, make sure it’s played safely. Children should never jump into the pool on or near other children. Enjoy the outdoors with “Carnival Fun.” Invite the kids to use their imaginations as your babysitter turns the yard into a carnival. LifeScript.com recommends creating a “carnival” where folding chairs, picnic tables, and benches serve as booths. Have the kids play faith-based games at each booth and then serve hotdogs for lunch. As a mom, I like being able to give my babysitter options for what to do with my kids. It makes me feel better knowing she’s sticking to activities that are safe and that I’ve approved. As a Christian, I love that my kids have Bible and faith teachings available to them each day. Lindsay M writes for PublicHealthCorps and, in her spare time, enjoys satisfying her other passions - like cooking, biking and photography. She is happily married to her high school sweetheart and is the mother of twin girls.